The Cedar Creek Lodge opened in the summer of 2016 and is situated in the small town of Columbia Falls, just a short, but a scenic 18-mile drive to the west entrance of Glacier National Park. 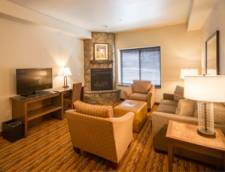 The traditional mountain retreat is designed with spacious layouts and outfitted with upscale decor. 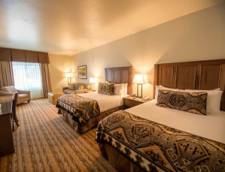 With comfortable beds and modern amenities, the Cedar Creek Lodge is the perfect place to relax after a day of exploring the park. The lodge offers both rooms and suites, coupled with a complimentary, daily hot breakfast. The lodge is open year-round and also boasts an indoor pool and hot tub as well as a fitness center. There is a free connector shuttle between Columbia Falls and the city of Whitefish, as well as a connector to the Whitefish Mountain Resort. The Fireplace Suite is a cozy, luxury suite that is sure to provide an impressive experience. The bedroom features one king bed and the separate sitting area has a queen sofa sleeper and two comfy armchairs arranged around the gas fireplace. The bathroom has a spa-style shower and a private toilet area. The modern suite is spaciously designed and features a bedroom with a plush king bed and a separate sitting area with queen sofa sleeper. 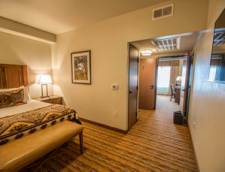 The suite features a full bath, televisions in both rooms and all the other modern amenities that the lodge offers. For those needing the extra assistance there are accessible suites available but must be requested upon booking. These Deluxe Rooms feature one king bed and a queen size sofa sleeper. 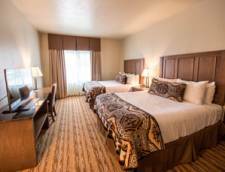 The room includes a private bathroom, modern amenities and sleeps four comfortably. Maximum occupancy may be exceeded by an infant in a crib. There are limited amount of ADA rooms available in this room style and you must request that upon booking to guarantee. This suite is ideal for families and groups, sleeping four comfortably with one queen in each bedroom. The two bedrooms are separated by a door and have a shared bathroom in the middle of the room. The suites don’t have a separate sitting area but they have all the modern amenities that the lodge has to offer. There are a limited amount of accessible suites available and they must be requested upon booking. The Deluxe 2 Queens sleeps up to six guests with two plush queen beds and a queen sofa sleeper. 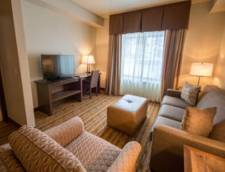 The room comes with the modern amenities such as a television, microwave and mini-refrigerator. Accessible rooms are available in this room style for those needing assistance but must requested upon booking. The Deluxe 2 Queens sleeps up to six guests with two plush queen beds and a queen sofa sleeper. The room comes with the modern amenities such as a television, microwave and mini-refrigerator. Accessible rooms are available in this room style for those needing assistance but must be requested upon booking. 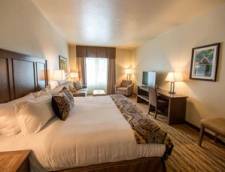 The Standard Room features two queen beds, a private bathroom and modern amenities. The room comes with a flat-screen TV with cable and HBO. Rates Policy: Rates are per room, per night, based on 1 or 2 adults and do not include tax or the surcharge that will be charged at check-out on all room reservations. Extra adult charges apply. Children 11 and under stay free when accompanied by an adult. Rollaways or cribs are available upon request if needed. Please note most room types will not accommodate a rollaway and/or crib, please refer to room type description. Rates and taxes are subject to change without notice.